Be part of the solution! All proceeds from your donation will go directly to assisting us in providing services to those reaching out for help in recovering from substance use disorder. Those services include outpatient, intensive outpatient, and low intensity residential services, case management, peer services, Telemedicine for Suboxone and Vivitrol prescriptions, GED classes and certification, Life Skills for job skills and simple money management, trauma yoga, art and music therapies and other support services. Most important you can be a part of someone’s personal solution to their struggle with the disease of Substance Use Disorder. 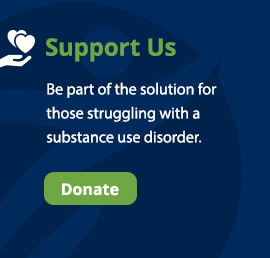 100% of your contribution goes directly to support clients’ needs at the Wells House and supports our continued commitment to bringing awareness about substance misuse to our communities. Online donations are offered securely through PayPal. To make a gift in honor or in memory of an individual, you will have the option to leave a comment on the second screen, before confirming your donation.